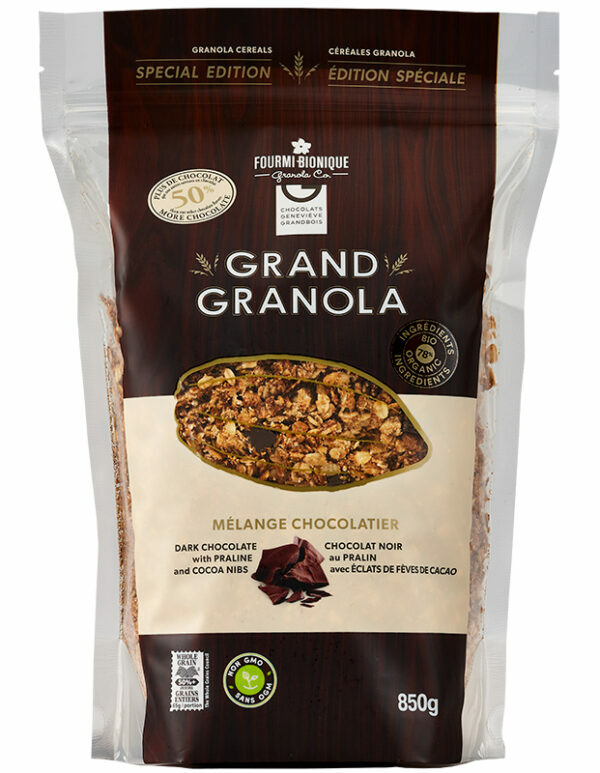 Granola cereal roasted with Quebec honey, specially made for those who appreciate high quality chocolate and manufactured in accordance with the greatest quality standards. The dark praline chocolate made by Geneviève Grandbois, rich and velvety, shares the spotlight with crispy golden flakes, letting the nutty notes express themselves to create a perfect harmony. This blend can be enjoyed right out of the bag, with yogurt or milk…to satisfy a craving while curbing your hunger in the most respectable way. For an extra source of inspiration, see our original granolas recipes! 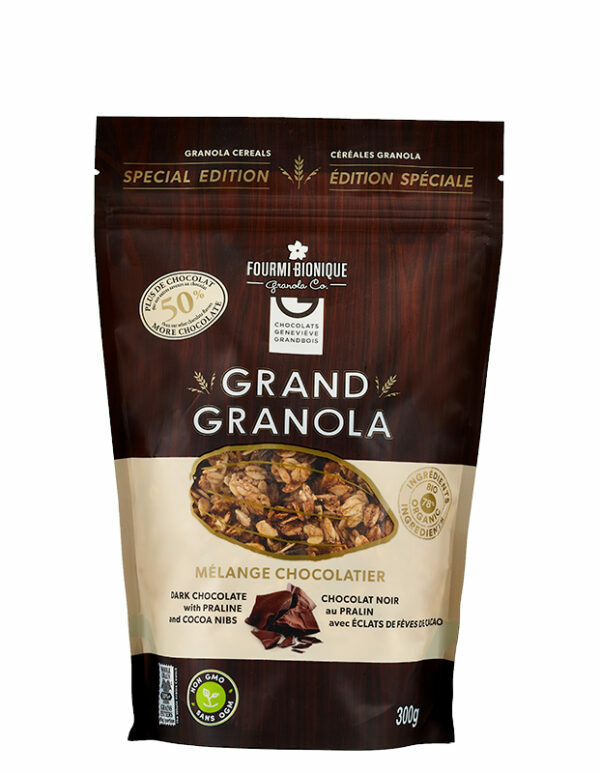 This product is certified by Ecocert Canada for its organic ingredients and Whole Grains by the Whole Grain Council. The Chocolatier is also available in an economic and recyclable bulk packaging. Rolled oats*°, Sugars (honey°, cane sugar*), Whole spelt flour*°, Sunflower oil and/or Canola oil, Dark chocolate with praline (cocoa mass, sugar, cocoa butter, hazelnuts, almonds, cocoa nibs, vanilla, soy lecithin, sorbitol, natural flavour), Rolled rye*°, Rolled barley*°, Oat bran*°, Tamari* (water, soybeans*, wheat*, salt), Coconut*, Sesame seeds*, Flax seeds*, Cocoa powder*¹. May contain cashews, macadamia nuts, pecans, milk and ingredients made in a facility that processes peanuts. The fusion of the roasted flakes and the generously presented soft pralined chocolate chunks creates a perfect hazelnut kick. Happy and reassuring like a birdsong in the depth of the forest.